My Own Domain is UP! Our summer journey continues as we head on to another weekend getaway in Little Rock, the capital city of Arkansas. Officially known as "The Natural State", Arkansas is known throughout the country for its natural beauty and abundance of natural wildlife. This summer, we would allow ourselves to be swept by the natural beauty of the historical Petit Jean Mountain and we would quench the summer heat by hitting the state's largest water park, Wild River Country. In all of our trips, I usually love to plan ahead by researching online. Jeff commends me for organizing our travel stuff like maps and directions to the place and the list of things that we can do. Well, everything's been made easier and friendlier with the internet as your tool. Let's talk a little about these two places. 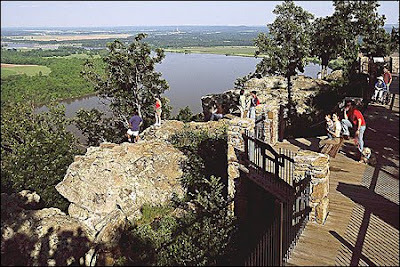 This picture that I found over the internet is the "Stout's Point", which is in the eastern tip of Petit Jean Mountain. A board walk has been constructed for the people who would like to marvel at the grand view of the Arkansas River Valley to the north and various mountains to the south. Nearby is the gravesite of Petit Jean (Adrienne Dumont), who according to the legend of Petit Jean, is a French girl who disguised herself as a cabin boy so as to secretly accompany her sweetheart, Chavet, a young French nobleman, who lived during the period of the French exploration of the New World. Knowing the hardships and danger on the journey, young Chavet of course didn't let Adrienne go with him and so she dressed herself like a boy so he can't recognize her and called herself Jean but the sailors called her Petit Jean which is French for Little John. Unfortunately, she was terribly ill while they stayed in the mountains, a few days before their voyage back to France. She eventually died with a request that she'd be carried back to the mountaintop and be buried at a spot overlooking the river below. Her legend and her death seemed to be what draws the people to this enchanting place. The picture below is from the Wild River website. 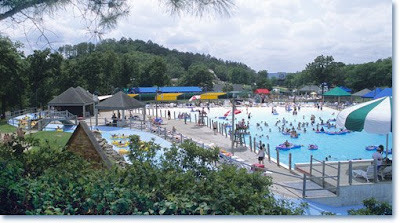 It is a wavepool which is just one of the exciting things you can find in the whole waterpark. I am excited to try their different slide attractions and the fun lazy river ride of course. I can't wait for July 4-6 to come. 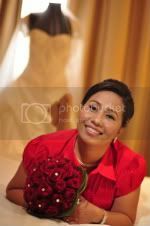 I'm sure this will be another fun and exciting weekend for me and my babe.